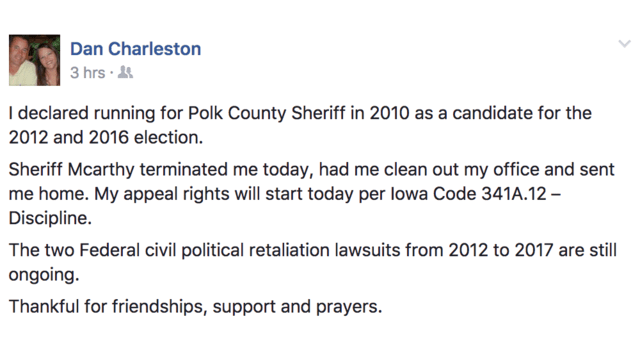 Dan Charleston, the Polk County Sheriff’s Office deputy who became the subject of an internal investigation earlier this month after posting comments on Facebook that denigrated all Muslims as adherents to an extremist ideology — news that was first reported by the Informer — has now been fired from the department. 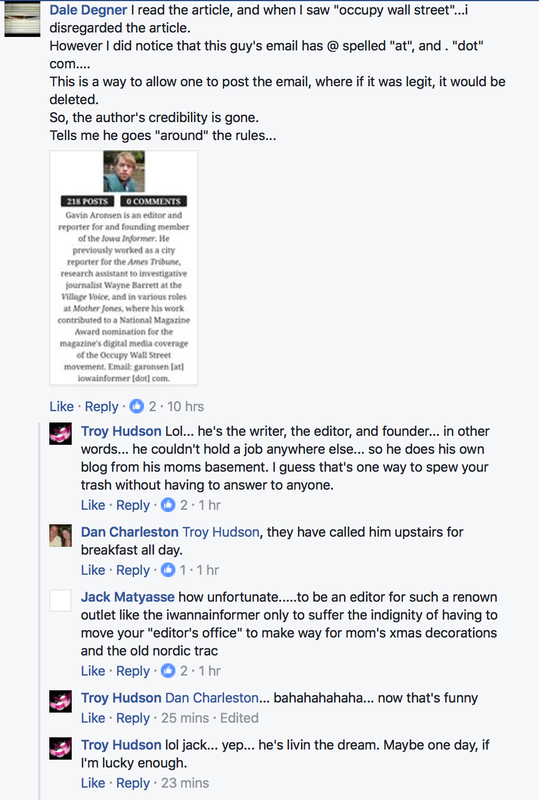 Charleston himself discussed his firing in a Facebook post that he later deleted, but not before WOI-TV took a screenshot of it. In the post, Charleston refers to Iowa Code 341A.12 (PDF), which refers specifically to disciplinary hearings that deputy county sheriffs can appeal their demotion or termination through. As he mentioned in his Facebook post announcing his termination, Charleston has sued McCarthy three times in federal court for supposed job discrimination (Charleston is a Republican and McCarthy is a Democrat). Two of the suits remain active but the other was dismissed. In one of the suits, McCarthy is accused of “engaging in willful and malicious conduct toward Dan including but not limited to referring to Dan as dangerous, cancerous, [and as] radical as one can get” — but Charleston does hold extreme views, including an affinity for the Constitutional Sheriffs and Peace Officers Association, an organization with ties to the anti-Semitic Posse Comitatus movement, the Oathkeepers, and Joe Arpaio, the infamous former sheriff of Maricopa County in Arizona who is now facing criminal contempt charges for refusing to stop targeting immigrants in traffic stops.